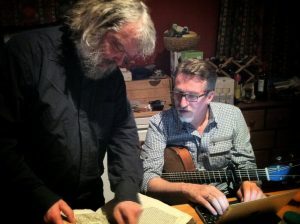 Singer/songwriter Steve Bell, and poet Malcolm Guite will be meeting again this summer at the CS Lewis Summer Conference in San Diego, June 21-23. Among other contributions, the two will together present an evening where they will share from their individual and collaborative efforts. Malcolm and Steve initially met at the 2011 C.S. Lewis Summer Institute in Oxford and Cambridge (Oxbridge). Steve was so taken by Malcolm’s poetry that he soon after began adapting the poetry for songs which became the basis for his 2012 CD Release Keening for the Dawn. Taking advantage of this summer’s reunion, Steve and Malcolm will afterward retreat for a few days to collaborate on new material for a future project.